In October 2016 the AUCOTEAM test laboratory was certified by DNV GL as an “Approved Testing Laboratory”. The world’s largest shipbuilding and offshore classification company has thus confirmed the competency of AUCOTEAM in the testing of ship building components and prototypes. 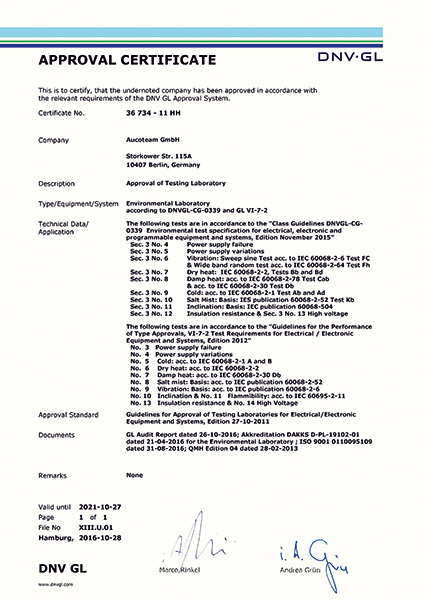 “Guidelines for the Performance of Type Approvals, Vl-7-2” Test Requirements for Electrical / Electronic Equipment and Systems. Our customers benefit from the expedient and uncomplicated certification process. Maritime Register of Shipping (RS) Russia.